Trincomalee District Tamil Peoples' Forum (TDTPF) Wednesday agreed to postpone until June 15 its general shut down action scheduled to take place after June 2nd demanding the removal of controversial Buddha statue after a ministerial team assured the Tamil Forum that the Urban Development Authority (UDA) would take legal action against the unlawful structure and necessary steps will be taken to withdraw army troops from the east port town, sources in Trincomalee said. The government team comprising Minister Mr. Maithiripala Sirisena, Deputy Minister Mr.Dilan Perera, Presidential Advisor Mr.Harim Peiris, North East Provincial Governor Mr.Tyronne Fernando arrived in Trincomalee Wednesday morning and held a four hour discussion with Trincomalee district parliamentarians Messrs R.Sampanthan and K.Thurairatnasingham, Mr.V.Vigneswaran, President of the TDTPF, Mr.S.Gowrimuhunthan, Mr.R.Jerome, Brammasiri Vikneswarakurukkal and Rev Fr.Annadas. The discussion was held at the official residence of the Provincial Governor. This was the second visit of the ministerial team to Trincomalee regarding the unlawful erection of the Buddha statue on a land close to Trincomalee central bus stand and being used for parking three wheelers, sources said. Minister Mr.Maithiripala Sirisena, parliamentarian Mr.R.Sampanthan and TDTPF President Mr.Vigneswaran addressed a press briefing at the conclusion of the discussion. Mr.Maithiripala Sirisena thanked the TDTPF for postponing its general shut down until June 15 to assist the efforts taken by the government to solve the statue issue. He assured that within two weeks an amicable solution would be found for the controversial Buddha statue issue. Mr.V.Vigneswaran said assurances given by the government should be implemented and the Buddha statue should be removed before June 12. "If the Sri Lanka Government fails to find a solution we will not participate in any future talks. This is our last ultimatum," said Mr.Vigneswaran. He said more troops and policemen are deployed in Trincomalee in recent days and Trincomalee is currently seen as a battleground. 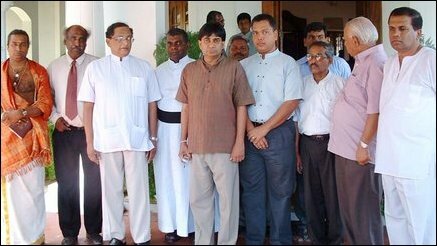 TDTPF pressured the government team at the discussion to withdraw troops from Trincomalee, he said. Mr.Sampanthan said the government should implement all the assurances given to the Tamil side in the Buddha statue crisis. The government team has assured that the UDA would initiate legal action against the unlawful structure with in two days' time. The ministerial team has promised to take up the troops' withdrawal demand when it meets Sri Lanka's President when the team returns to Colombo Wednesday evening, he said.